I love my IKEA Idelisk tray. It currently sits on our coffee table to hold the coasters and stuff. Last year I kept it on my vanity with jewelry. I saw Kraft’s chocolate-peanut butter spread, and it’s phenomenal. In two weeks the jar is almost gone. Oops. The jar on the left is “Beeswax Skincream” from Little Rock Honey. My mom found it for me at a Christmas market last year, and it’s been really helpful for eczema. I’ve been getting heat rash in my elbows since there’s been so hot in Toronto. I don’t wear makeup every day, since I’m still job-hunting. Yoga and meditation at home doesn’t require makeup. 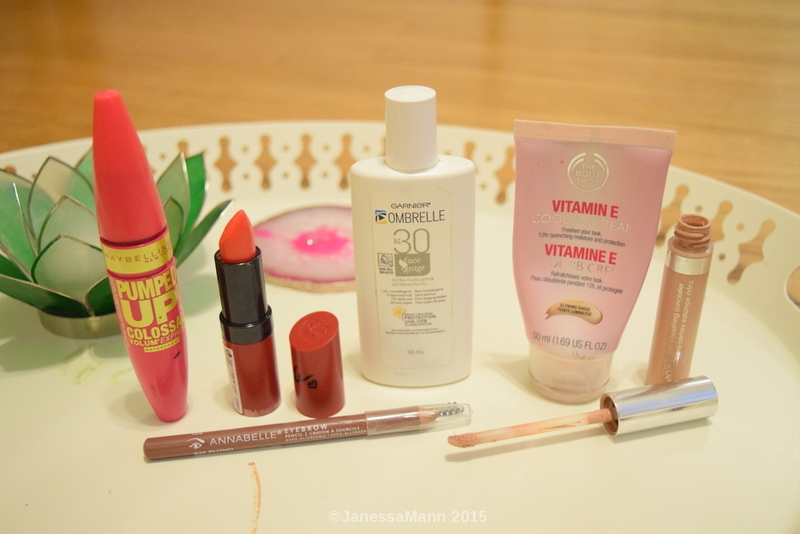 When I do decide I want a little coverage, I always wear my Garnier Ombrelle face sunscreen, which feels mattefying like a primer. 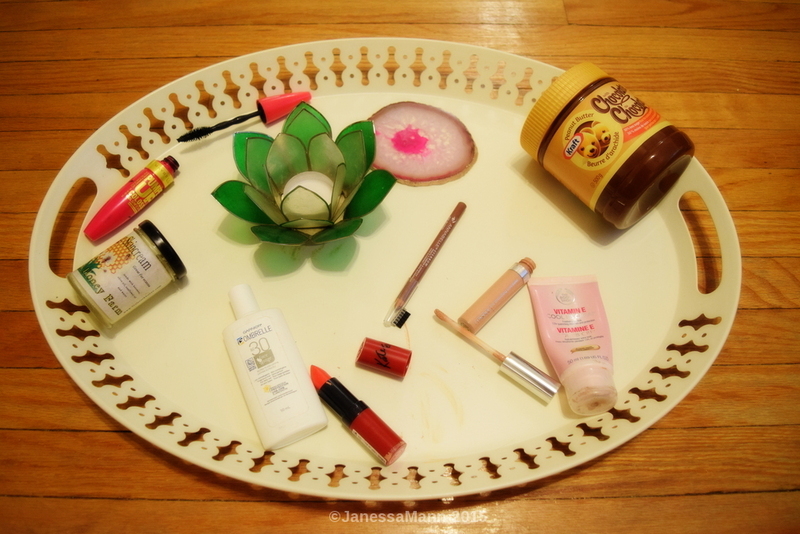 Then I use the Body Shop’s Vitamin E Cool BB cream. If I’m not being active, I can use this Clinique Line Smoothing Concealer, which I don’t have specific thoughts about, but the colour only matches me in summer. Eyebrows are Annabelle 020 Blonde. Lashes are Maybelline’s waterproof “Pumped Up Collassal“. The best part? Revlon’s Lasting FInish by Kate Lipstick #110. This month I decided to try meditation. I figured that since I’m not working yet, and I’ve been lying around doing yoga and reading, I must have time to try meditation. I searched online to find Android apps that are good guides, since previokusly I’ve never liked the apps found. I found Calm, which has some guided “courses” for learning how to meditate, timers for once you’re comfortable, and sleep guides. The guides I’ve done so far have been very calming and encouraging. They even have a calendar that tells you if you’re on a streak (I’m 6/6 so far!). I can’t tell if it’s relaxed me that much, since I’m not stressed right now, but I look forward to continue doing it. 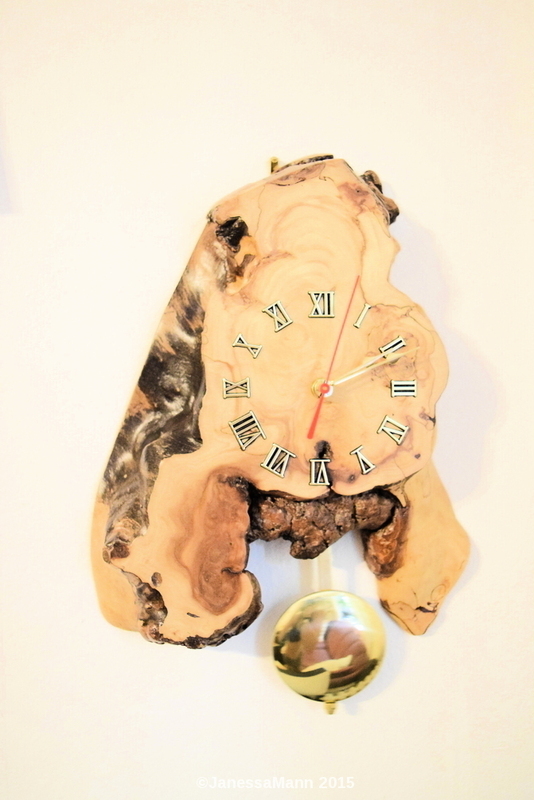 This tree trunk clock was a wedding gift from my Oma. It was made by a man named Henry Neufeld. He is pretty “famous” in the Mennonite world for his carpentry. So obsessed. 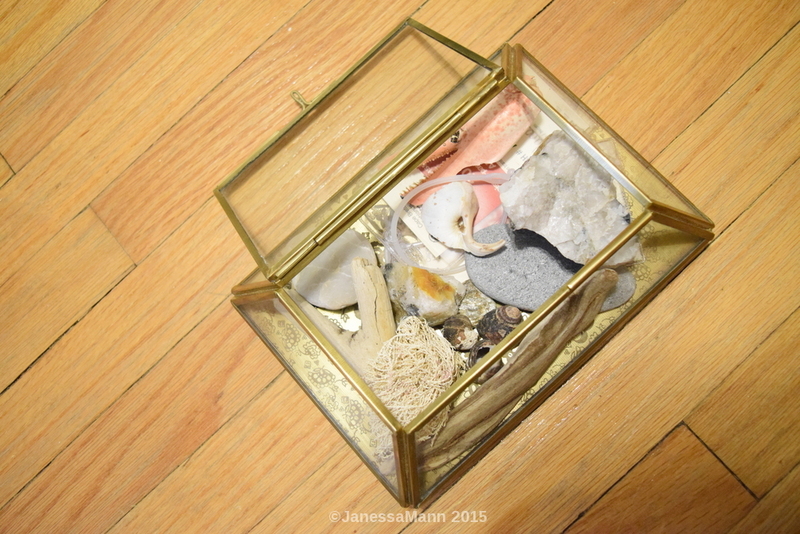 Today I found a beautiful glass box from Urban Outfitters to put the little things we found on our honeymoon. Yeah, maybe they tell you to not take anything “except pictures” but we grabbed some shells, rocks, seaweed, driftwood, and a claw.